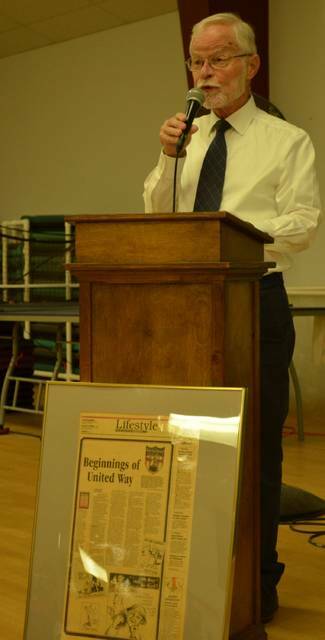 Longtime United Way of Greater Lima volunteer David Adams gives a presentation on the history of United Way in Lima during the kickoff event of the organization’s 100th anniversary. LIMA — The United Way of Greater Lima kicked off its 100th anniversary Tuesday with a presentation on the history of the organization in the city and a video of the first of 100 Community Champions, all of whom will be recognized later this year. One of the programs to make a significant impact on the community has been the Kindergarten Camp, she said. It helps prepare children for school and better succeed in their studies. The United Way began in Lima in 1918 as a fundraising campaign, authorized by President Woodrow Wilson, to benefit local war-related services such as the Red Cross, the Salvation Army and the YMCA. It was known as “The Allen County War Chest of 1918” locally. This first campaign raised $650,000, equivalent to $10.8 million today, said David Adams, a United Way volunteer since 1971. During the Great Depression, the “Community Chest” was used to help local families in need. Adams said $24 could purchase clothing for a baby for one year, $12 could provide a family with housing for one month and a family could eat for a week with $5. In 1956, the name “Community Chest,” was changed to “United Fund,” and the first campaign under that name was held. It raised $52,000 above its goal of $344,000. In 1972, “United Fund,” was renamed to United Way. The 1996 United Way campaign raised over $2 million in Lima for the first time. Lauren Cunningham, 13, was the first of the 100 Community Champions to be revealed during the event. She is a leukemia survivor and has organized blood drives through Red Cross and works with Nationwide Children’s Hospital to give cards and gifts to children with leukemia and other cancers, said United Way Marketing Director Ashley Gray. A video and biography of Cunningham, who could not attend, can be found on the United Way of Greater Lima Facebook page, Gray said. The anniversary celebration will continue with two additional events this fall. The Day of Caring, the kickoff for this year’s campaign, will be held at 7:30 a.m. Sept. 7 at Veterans Memorial Civic Center. The United Way will hold its gala event from 5 to 7 p.m. Oct. 27 at the Lima Knights of Columbus hall, during which the 100 Community Champions will be recognized.